UPDATE: Listen to the media coverage of our rally on WRVO radio. 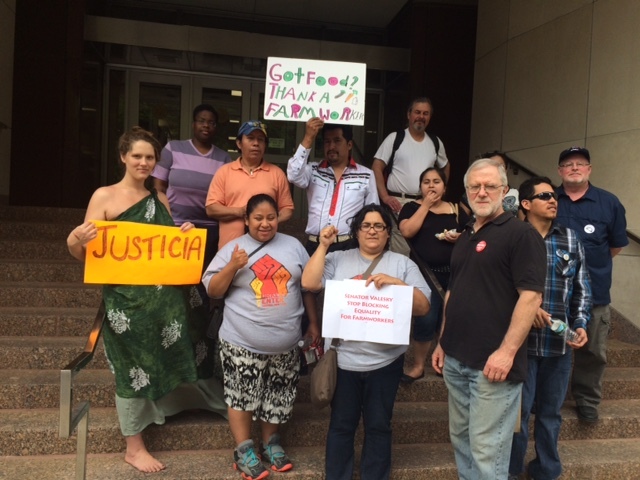 WCCNY worker leaders and allies rallied and marched to support Justice for Farmworkers. After we had a rousing rally where WCCNY worker leaders, labor activists and NYCLU members spoke, we marched to Senator Dave Valesky’s office downtown to urge him to support and vote in favor of the Farmworker Fair Labor Practices Act which would give farmworkers basic labor protections afforded to all other workers. The message we brought to Senator Valesky. If only Valesky was as (or even more) disgusted and offended by a Jim Crow era exclusion in labor law that denies farmworkers of basic human rights and dignity. If only Valesky was disgusted by the long arduous 80-90 work weeks farmworkers work without paid overtime and no guarantee to a day of rest. Valesky said that his unwillingness to commit to supporting the legislation stemmed from his concern for both sides of the issue, meaning farmers and farmworkers, as well as his concern with the “health of the agricultural industry.” Unfortunately, we are all too familiar with this oft-cited concern whenever farmworkers assert their voices and their rights to basic dignity and labor protections. We heard this canard in regards to the Fight For $15 when the farm lobby said that an increase to the minimum wage would be a disaster to the industry. Political officials heard their cries and responded by giving farmers $30 million in subsidies to implement the new minimum wage increases. This leads us to ask, why must the concerns and needs of farmers and the health of the agricultural industry always come at the expense of farmworkers? How can there be a genuine concern for “both sides”when political officials keep putting the human rights of farmworkers on the back burner? This is absolutely untenable and unconscionable. 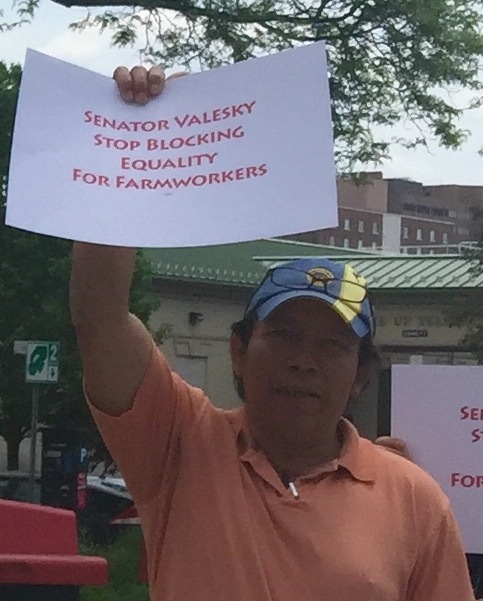 Thankfully, we are not deterred by Valesky’s equivocation or unwillingness to take bold and courageous stands on fights for farmworker justice and equality. We will continue to look to and be inspired by farmworkers, those that are members of WCCNY and others all across the state and the country, who are steadfast and determined in their right to win the rights they know they deserve. This is a bulletin board in Senator Valesky’s Syracuse office. It proudly displays an “I support NY Agriculture” sticker from the Farm Bureau, a farm employers organization that represents the interests of the farm industry in NY. The Farm Bureau is a strong opponent of the farmworkers bill of rights. Senator Valesky works strongly in support of the Farm Bureau. In his office in Albany there is also a big poster from the Farm Bureau. Senator Valesky, stop opposing workers rights. Stand with workers, not special interests groups!